On the morning of Friday 31st October, my EAPPI team mate Emmi, from Finland, and I travelled north of our home base in Jayyus with our driver and mentor, Abed, to monitor an agricultural gate near the small village of Zeita. We got there at 7:00am,the rain was pouring down. We decided to stay in the car for a while, hoping that the rain might ease up. We looked down towards the gate and saw two women sitting in the pouring rain, one with a dirty plastic sheet pulled over her and the other just sitting in the rain getting saturated. The gate is meant to open at 7:00am to let these women get into the Seam Zone to pick olives or other vegetables from the many greenhouses just a few hundred metres from the gate. But the gate wasn’t going to open at 7:00am today, nor had it done so for many months. For some reason the soldiers didn’t feel that this gate was a high priority and they had been turning up pretty much anytime they felt like from 7:00am to 8:30am. Anyone wanting to get through the gate just had to make sure they got there early just in case the soldiers actually came on time, opening and closing the gate before you got there. On this occasion it meant sitting in the rain while you got wet to your underwear. No shelter is provided and the women sit on old discarded plastic buckets and bottles to stop themselves from sitting directly in the mud. 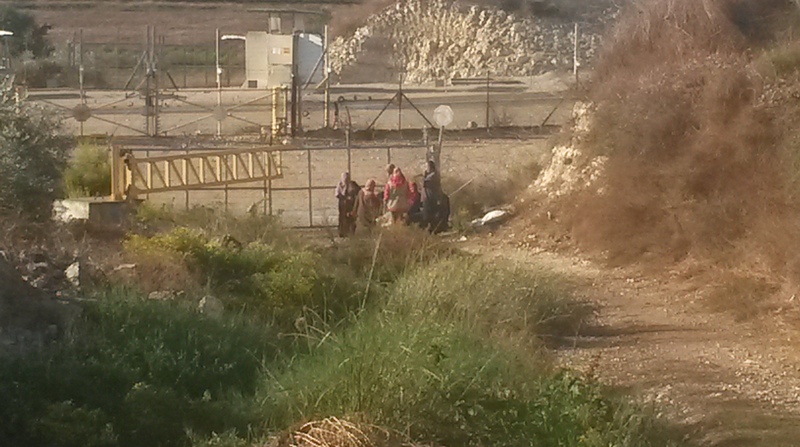 A small group of Palestinian women waiting to get into the Seam Zone to do a days work. Life is hard for these women and though their smiles to us and each other shone brightly, many of them looked much older than they probably were. My Arabic is very poor but my team mate Emmi can communicate reasonably well with most people here. We tried to speak to one lady who asked our names and where we were from. I wanted to know if she had any children so I put my hand out parallel to the ground but at a very short height hoping that she would understand that I was referring to her children. As soon as I did this she started crying. Emmi was able to find out that this woman was married with one child but her husband had died a few years ago, leaving her to live with her 27 year old son. Our driver, Abed, was also able to discover that her son had gone to a demonstration in the refugee camp in the nearby town of Tulkarm, and had been shot dead by the Israeli military and now the woman lives alone. She wakes up in the night afraid and on her own and now only darkness seems to fill her life. As Abed told us this, tears started to well up in Emmi’s eyes and when the woman saw this she immediately reached into her pocket and handed a chocolate bar to Emmi saying “ Al Ham du Lilah!”, “Al Ham du Lilah!” meaning “Thanks be to God! Thanks be to God!” in order to comfort her. Before we knew it we were being served tea, coffee and chocolate by all the women who had gradually gathered to get through the gate. One of them said she liked my fishing hat that I wear all the time. It is a dark blue, broad brimmed hat with a logo showing Fowlers Bay Eco Park – my all-time favourite fishing spot back home! It was so funny that they liked it that I gave it to them and pretty soon everyone was cracking up with laughter as they passed it around trying it on! And this is the picture I keep getting here in the West Bank. People being forced to live under sorrow and oppression but never failing to be hospitable and share in the funny side of life. Eventually the soldiers arrived and opened the gate. About 15 women and a few young boys passed through in order to do a day’s work. Working in the Seam Zone is problematic at the best of times. Suhad Hashem, from the Palestinian Medical Relief Society (PMRS), told us that getting medical help if you are in the Seam Zone is very difficult because ambulances are not allowed into the Seam Zone unless they go through the long process of the checkpoints. If you are in an emergency, then the ambulance must stop at the checkpoint and the person must be brought to the checkpoint from the other side where they have been injured, then go through the checkpoint and be loaded on to the ambulance and taken to hospital. A person injured or sick in the Seam Zone cannot be treated in Israel where better medical facilities are common. There are stories of people dying in emergencies because they can’t get through the checkpoints quickly enough but a far greater problem is that people miss appointments and don’t get the medication they need in time to prevent their conditions getting worse, ultimately even leading to them dying prematurely of preventable causes. If the state of Israel respected International Law, then these women would be better looked after, but as it is, vulnerable people like them are at the mercy of a system that is indifferent to their plight, just the opposite of what a nation that says it cares about human rights would be doing without having to have International monitors visit them to protect the people who need it most. Life in the Seam Zone is tough, but that is just one part of the story of the Occupation. I am participating in a program as an Ecumenical Accompanier serving in the World Council of Churches’ Ecumenical Accompaniment Program in Palestine and Israel (EAPPI). The views contained here are personal to me and do not necessarily reflect those of the National Council of Churches Australia or the World Council of Churches. If you would like to publish the information contained here (including posting on a website), or distribute it further, please first contact the EAPPI Communications Officer (eappi.communications@gmail.com) for permission. Thank you.